Written by Natalie Holmes on on behalf of www.be-my-guest.com who offer short stay Berlin Apartments, with an illustration by Jaime Huxtable. You might think that there’s no better place to learn German than the capital of the world’s most populous German-speaking country. But you’d be wrong. Berlin is an international city where you can, more or less, get by without speaking the language. Whether or not you’d want to–or should–has been hotly debated lately, but for those who do, the fact that so many people speak English in Berlin can present a very real barrier to learning German. When I first arrived here almost four years ago, I spent a few months in totally unexpected culture shock. Sure, many people speak English, but that hardly helped me to decipher this new and strange city, with its impossibly long words and curious customs. As soon as I had time, I enrolled on a beginners course at my local Volkshochschule. It didn’t take long to realise that the more German I learnt, the more comfortable I felt in Berlin–and since I planned to be here long-term, knowing the language became a priority. It seemed essential to my well-being. Trouble was, I’d already begun forming a group of friends for whom English was the lingua franca. Of the many surprises offered up by Berlin, one of the least predictable was the struggle to speak German. On the long journey to making this city feel like home, here are some ways I’ve found to help master the Muttersprache. This one’s kind of obvious, but shouldn’t be overlooked. When I ask Scandinavian friends how their English got to be so perfect, they often say it’s through watching subtitled films. There are some excellent German-language films you can watch holed up at home, all in the name of education. My favourites are epic BBC mini-series Das Boot, Wim Wenders’ classic Der Himmel über Berlin (Wings of Desire), cult favourite Lola Rennt (Run Lola Run) East Berlin spy thriller Das Leben der Anderen (The Lives of Others), jolting social experiment Die Welle and practically anything by Michael Haneke. Most DVDs offer subs in a range of languages, but make sure you check the box if you’re buying from Germany, as the older ones probably won’t. It’s also possible to download subtitle text files and sync them with the film you’re watching. And it also works the other way round. Despite the dubious German tradition of dubbing films, some cinemas (like many in the Yorck group) show new releases in their original language with German subs (OmU). I find reading along in German as effective–if not more so–than hearing the German and reading in English. Plus those cinemas are beautiful, and their popcorn is the best in town. A German friend invited me to her local Kneipe one Sunday evening to get involved in the nationwide tradition of watching an episode of TV crime drama Tatort. I accepted, consoling myself that if I didn’t understand, hey, at least I’d be at the pub. But I did understand, mostly. Not every word, of course, but enough of the plot to genuinely react to twists and join in the with audience’s exaggerated shock at just the right moments. On a more day-to-day level, listening to the radio can be helpful. FluxFM have a feature called Lesen und Lesen Lassen that’s broadcast daily and also available online. Each day, a bite-sized section of a different book is read out, in German. I rarely understand all of the story, but as time goes by I notice that there are now more familiar words than unfamiliar. If it’s still all sounding indecipherable, try Deutsche Welle’s excellent Radio D, which is specially geared towards beginners, with basic vocab at a more leisurely pace. It’s amazing how much new vocab I’ve learnt from fumbling my way through German Pilates and yoga classes. The good thing about those sort of classes is that you can get away with sneaking glances at your teacher (or classmates if your eyeline happens to be skewed by some awkward contortion) and following the moves without knowing exactly what’s being said. 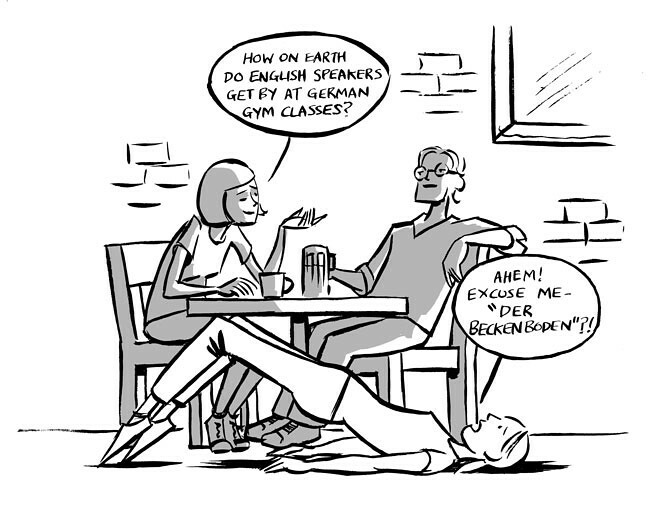 It wasn’t my intention to have learnt so many anatomical words and verbs through going to German gym classes, but a happy side-effect nonetheless. Now, when everyone’s at the pub talking about flexing their pelvic floor (der Beckenboden–in case you’re wondering), I can join in unembarrassed. Another idea that seems simple enough in theory, asking to speak German can be a scary thing to do–not least because if you’re the one requesting it, then you’d better be able to hold a conversation. I’ve sat before in a group of people, all German except me, and everyone’s talking English. It’s silly and a bit embarrassing. But it’s easy. At some point embarrassment turns to shame and I hear myself say “Wir sollten auf Deutsch sprechen, oder?” There’s only so long I can sit there in silence, following the conversation but too slow to construct sentences to make a point before it moves on. In the end, I just have to blurt something out, word order all over the place. Someone replies. They knew what I meant! They didn’t laugh! Next time it’s easier. Similarly, who’s ever tried their very best to speak German to a local at a party, say, and met with replies in flawless English? Even when I persevere in this situation, replying stubbornly in German while my German counterpart persists with English, I inevitably lose the game, trumped by some complex grammatical structure or another. I get that it might be annoying to speak to someone struggling with a new language, but Germans, please, be patient with us. Humour us. Speak German to us! Of course, the best way to get better at German is to practice speaking it as much as possible. Predictably, all the best German speakers I know have either spent time immersed in Germany outside of Berlin or live with a German speaking flatmate or partner. But if shacking up with a native is not a feasible option, just fake it til you make it. Tandems are a popular option, where you meet up with a native speaker and spend half the time talking English and half talking German, and I recommend signing up to a service like Erst Nachhilfe to find the perfect partner. In fact, lots of friends have not only improved their language but also found themselves with a new boyfriend or girlfriend by seeking out a tandem. After all, when else do you spend so much one-on-one time talking about each others’ lives? The only risk is that if one of you is better than the other at their respective second language, you’ll slip into bad habits. Make sure you structure the conversation and stick to half and half, no matter how painful at first. Finally, treat yourself to a holiday somewhere rural and remote, where you know there’s little chance of people speaking English. The lake district in neighbouring Mecklenburg-Vorpommern, for example, is spectacular. Go off peak and off season and it’s a cheap but worthwhile break, and a chance to explore the beauty of Germany that so often gets buried beneath the bustle of Berlin. I am moving to Berlin in December (2013) and am learning German at the speed of snail whilst still in London. All the books and CDs contribute very little and I am finding that trips to Berlin (about 9 a year) and speaking with my German missus are a thousand times better. I hope that the immersion method when I am there works and I pick it up speedily. I am definitely not a natural linguist!! That’s exactly what we found – that studying back in the UK was a little too theoretical to really bed in, and that as soon as we arrived we picked up the language much more quickly. Speaking German well is another thing, but with some basic learning behind you and some real-world context, you’ll start to understand a lot more once you’re actually here. Good luck with the move Dave! Once you’re in Berlin you’ll be flying and getting to know the day to day local lingo that you can’t learn from a book. As well as speaking with your missus, I can highly recommend a tandem partner, as mentioned in the article. Using regular flats for holiday rental business is now illegal in several Berlin neighboorhoods due to the growing housing crisis. If you want to make money you should buy an hotel. The party with tax free earnings is over, everyone is going to get a nice letter from Finanzamt in the next 2 years. This people you advertise here don’t even have a german VAT Number on their website ! As we understand, it is of course perfectly legal to own a holiday apartment in Berlin, as it is to advertise one. However, owners may need certain permissions in specific conservation areas. Only German businesses, registered in Germany need a German tax number displayed on their website and consulting a qualified advisor is always better than hearsay. The article was about how to improve one’s German language skills, based on ours and Natalie’s own experiences in Berlin.